In an excessively consuming society, bioengineering provides an efficient solution for food crises. Scientists and industry stakeholders have already identified potential uses of engineering sciences in virtually every segment of the food industry, from biosynthesis and bioconversion to the utilization of genetic engineered and alternative foods and food-related products. The lack of knowledge and awareness regarding the current situation, problems and scientific progress of most recent technologies and their applicative potentials contribute significantly to the low development and implementation of novel approaches related to bioengineering of foods. In this context, the aim of the series entitled: "Handbook of Food Bioengineering" is to offer a broad and up to date perspective regarding the most recent advances, current position and potential impact of bioengineering on the food sector. The series brings together the newest technologies and approaches regarding classic and alternative foods, processing techniques, preservation, packaging, food control and biosecurity. The implication of materials science, engineering, nanotechnology and biotechnology on the progress of future foods, as well as the potential impact on human health and ecology are also clearly highlighted by this multivolume set. The volumes reach many types of readers, from scientists, engineers, academic, pharmaceutical, biotechnological and industrial sectors, to those interested by the progress and future of the food-related environment. Although many research studies and innovative applications have been recently developed and they could be found in multiple independent scientific papers, currently there cannot be found such a dedicated, extensive and up-to dated books, revealing all these relevant aspects of food bioengineering. 　Each volume contains interdisciplinary content needed to revolutionize new methods and to empower precise and robust testing in the food chain. Affiliation: Department of Microbiology and Immunology, Faculty of Biology, University of Bucharest; Department of Science and Engineering of Oxidic Materials and Nanomaterials, Faculty of Applied Chemistry and Materials Science, University Politehnica of Bucharest; Qualifications and Experience: Assistant Professor – General Microbiology, Medical microbiology, Immunology, Immunopathology. 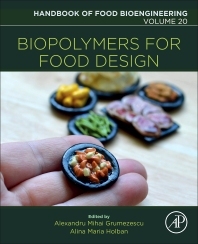 Biopolymers for Food Design, Volume 20 in the Handbook of Bioengineering series, describes how biopolymers have made a major impact in the food industry, from food design, to food control and safety. Biopolymers can be used in the development of novel nutritional alternatives, to replace difficult to obtain food products, or for foods inaccessible or inappropriate for a particular population (i.e. allergic to specific components). In addition, some polymers can be used as functional ingredients, and can also represent efficient scaffolds for food ingredients with therapeutic values. This valuable reference is ideal for those looking for new solutions for the food industry.